Saskatoon, SK, October 29, 2015 – Local Radisson Hotel Saskatoon Executive Sous Chef, Chris Corkum returned home to a warm reception this week after winning gold at the three-day Global Chefs Challenge in Quito, Ecuador. Competing against some of the world’s best chefs, his win qualifies Corkum to compete against the winning chefs from Europe South, Central and North, Asia, Pacific Rim and Africa/Middle East for the 2016 world title in Athens, Greece, as part of the World Chefs Congress. “Winning gold against the best chefs from around the world is an incredible honour. We are very proud of Chris,” says Steve Giblin, President & CEO of SilverBirch Hotels & Resorts. “With his win first nationally and then on a global stage, Chris is a shining and well-deserved example of the dedication and mastery of cuisine that our chefs embody. National winners from Argentina, Ecuador, Canada and the United States were invited to the Americas’ semi-finals in Ecuador, October 23-25, 2015. Each chef was given the same, specific ingredients and challenged to create a three course menu plating six plates each for the global jury. Corkum trained for months, perfecting his menu which featured three types of fish (salmon, lenguado and scampi), three cuts of veal (the blade, sweetbreads and loin) and a decadent dessert using a specific type of chocolate native to Ecuador. Corkum’s unique pairings won over the judges, who selected the Radisson Hotel Saskatoon Executive Sous Chef as the crowning champion. Corkum will represent the Americas at the World Chefs Congress and Expo September 24-27, 2016 in Thessaloniki Greece. 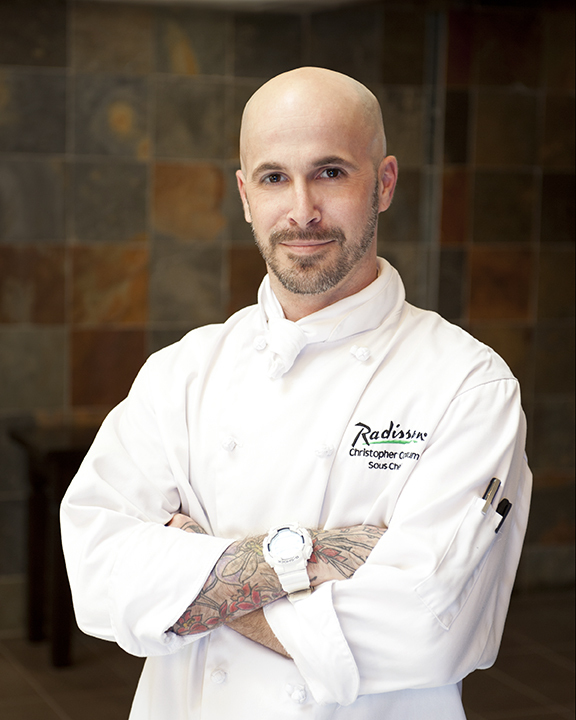 Visitors can experience Chef Corkum’s award-winning culinary skills at the Radisson Hotel Saskatoon, where he works as Executive Sous Chef.